The other day I saw an elderly lady hobbling her way into a store with her walker, and of course I immediately noticed the bright neon green tennis balls that she had affixed to the non-rolling ends of her walker. It occurred to me that I used to see this all the time. In fact, I remember the very first time that I saw it when I was a child visiting my great-grandparents in a nursing home. Even then I immediately knew their purpose- to help the walker glide along over various surfaces and to prevent marring of floors. But why, 30 years later, are tennis balls still the preferred solution? Can’t someone come up with something better? Actually, I suppose they have. Which is why I hadn’t seen this patched together tennis ball transportation solution in awhile (see? this IS transportation-related, because I just used the word right there!). The better design over a traditional walker altogether is the “rollerator,” which provides better mobility, braking, a seat to rest on, and a hilarious name (although I personally would have gone with “The Roll-inator” myself because it sounds even more diabolical). Slowly the rollerator has taken the place of the walker, except probably in nursing homes and other places where pinching pennies is more important than preventing deadly falls. But before this break-through in walker design, why did a device designed for lobbing over a net with a racket become the standard accessory for a rehabilitation aid? Well I have attempted to trace the origin of this hack, and discovered that it likely began in nursing homes and hospital rehab wings. Imagine for a moment that you work in such an environment. You probably work 10 or 12 hour shifts, and since you aren’t the doctor or the RN, you’re likely making just over the minimum wage allowed by law. If they could find a way to pay you less and keep you from quitting, they would, and they’re probably already working on it. Now imagine that your day is filled with the sound of 50 or so partially-mobile old folks dragging and rattling their cheap-o aluminum walkers across the linoleum. All day long they creek and drag. They rattle and squeak, while down the halls they creep. Poe could use 30 pages to describe the horrors of this sound! So I imagine that one day someone (who was no doubt recovering from a tequila hangover) had just fricken had enough of that noise, and lost it. She went to the sports store on her lunch break, and came back with a cart-load of tennis balls and just went berserk coving the ends of all the walkers in her department. Everyone thought that she lost her mind, but then they noticed something...silence. The reign of walker screeching terror had ended, and soon the practice of destroying tennis balls for sanity’s sake would spread across the globe, much to the delight of companies like Spaulding and Wilson, who no doubt enjoyed an unexpected and baffling bump in sales. 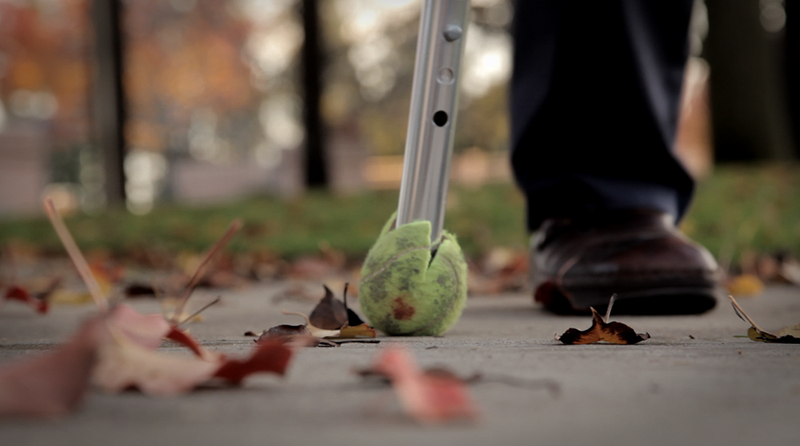 As the users of these walkers would transition back home, the tennis ball concept would come home with them. They really do work fairly well at gliding over surfaces and preventing marring of floors, even though they wear out very quickly. But then things just went nuts. Tennis balls became synonymous with walkers. Everyone had them. Amazingly, instead of companies working to solve the flaws of walker design with a less-ridiculous approach, the industry took the tennis ball phenomenon to the extreme. You can now buy tennis balls that are pre-slit for walker installation. More than that, they have become a fashion accessory that you can get in various colors and patterns to match your grandmother’s sassy style. She can get colorful tennis balls that compliment the color of the cat that is embroidered on her sweater. She can even show off her patriotism by dragging red-white-and-blue balls across the Walmart parking lot. But can you get them that don’t look like tennis balls? Don’t be ridiculous! Why would you even ask that! Only tennis balls belong on the bottoms of walkers. Right? RIGHT? If they don’t have that faux-stitching pattern on them grandma would be embarrassed to go out into public. What would the other grandmas think of her? But as this blogger points out, the tennis balls are not the optimal solution for all people. She makes the case that the tiny contact patch wears out incredibly fast. She also states that children point at her tennis balls, and dogs chase her. And you know what? Those children and dogs are right. Those tennis balls do not belong there. It addresses the problem of the contact patch wearing out by making a removable insert that can be switched out when it wears. It also ditches the sloppy cutting of the ball, and has a nice cap in it that fits perfectly over the end of the walker. Wait! Why the hell do we need the part between the walker leg cap and the insert to exist at all, let alone look like a fricken tennis ball? Why is this happening? Just take the felt pad and attach it directly to the walker. No tennis ball necessary! On no they d’in’t!! They made stupid casters out of tennis balls. Wheels already exist, people. We do not need to re-invent them using gosh-darn tennis balls just because they are being applied to walkers. Notice anything about them? Something perhaps tennis ball-esque in their appearance? Why?! They are just grips that hold a tennis ball nicely, right? This solves the problem of having to cut the tennis ball, and the contact patch wearing out, as you can move the ball around, right? WRONG! What cold be a simple design that could just hold a tennis ball, instead holds a fake tennis ball, but it still is made to look like a tennis ball because.......reasons, I guess? I give up trying to understand this. The only thing I know is if you can, buy a rollerator. If you can’t, and get stuck with an old walker, just buy these simple plastic glides. They work just fine and aren’t inexplicably pretending to be tennis balls for unknown reasons. What in the world is this?